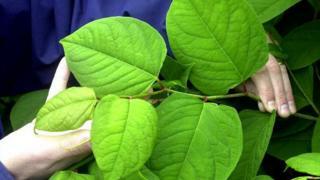 Gardeners searching the web for advice on the best way to tackle Japanese knotweed are likely to find confusing and contradictory advice, a study says. Researchers found the accuracy of information varied significantly, and could result in the further spread of the non-native invasive plant. Japanese knotweed is one of the most damaging invasive species, estimated to cost £166 million each year. The findings have been published in the Journal of Applied Ecology. "I was trying to put myself in the shoes of someone who had Japanese knotweed in their garden and thinking what I needed to know about it," said co-author Beth Robinson, a PhD student at the University of Exeter's Environment and Sustainability Institute. "I thought the first place I would look is on the web, and I wondered what information I would find," she told BBC News. The team looked at information provided by NGOs, weed control companies, government bodies, the media and the property market. "There were definite differences between how the different categories presented the information," Ms Robinson observed. "The knock-on impacts, such as the cost of controlling or eradicating Japanese knotweed, problems with planning permission or a reduction in land value... was the element that varied most significantly." The researchers stressed that tackling the invasive species needed to be considered on a case-by-case basis. They said some some occurrences would require professional assistance, but many small-scale cases in domestic gardens would not. They warned that advice that concentrated or overemphasised the risks (such as fines and enforcement notices) could lead to "unnecessary anxiety and expenditure". Guidance on the UK government web-page dealing with the issue of preventing the spread of invasive species begins by outlining an individual's obligations, which includes preventing non-native invasive plants from "spreading into the wild and causing a nuisance". It then highlights the potential consequences of failing to do so: "You could be fined up to £5,000 or be sent to prison for two years if you allow contaminated soil or plant material from any waste you transfer to be spread into the wild." The Royal Horticultural Society tells visitors to its website that "it is not illegal to have Japanese knotweed in your garden". It then points out how amendments to 2014 legislation affected homeowners before providing a link to the source document from the Home Office. Although Japanese knotweed (Fallopia japonica) arrived in the UK in an unsolicited package of plant species in 1850, it was soon being cultivated and sold by an increasing number of plant nurseries. Plant historians say the sharing of cuttings and the dumping of unwanted specimens were the primary cause of the spread of the plant through the country. This was compounded by the quick-growing species' ability to thrive on disturbed soil, allowing it to rapidly spread along watercourses and roadsides. It is now estimated that the annual cost of the plant, which can grow one metre in a month, to the UK economy is £166 million. Ms Robinson said the study highlighted a need for clear and consistent advice about the correct way to handle and dispose of Japanese knotweed. "We recommend that local and national authorities collaborate and work towards disseminating more consistent messages," she suggested. She said the technique used in her study could be used to assess the quality, consistency and reliability of advice for other non-native invasive plant species.